Amazing location. Right on the sea. Beautiful secluded beach nearby. Beautiful warm house with all the amenities you could want. Probably should be 3 1/2 stars !. Excellent location but the house is in need of an overhaul and organisation ! Protection to floor and furniture with mats and blankets is not very inviting and in some cases the mats were a trip hazard. It didn't feel like a holiday home - more like someones house who didn't want anyone there. Compared to our previous experience of Rural Retreat properties, this was disappointing. The advertised wine cooler didn't work. The toilet flushes were all a bit hit and miss. There was no mention of the precarious access to the beach. Not worth the price we paid !! Needs a more business like approach. Thank you for your feedback. I am so sorry that you were unhappy with aspects of The Crag and I will pass your comments on to the owner. Location wonderful & weather excellent. Property homely and comfortable but not as spick & span as we have come to expect from a Rural Retreat Property. The location is great, the house is friendly, slightly dated and we thought a bit cluttered. realising that is to our taste. The kitchen is well equipperd and the beds are great. The Crag is perfect! We couldn't have had a better experience. The house is gorgeous, clean, comfortable, well laid-out and has everything you could possibly need. The wifi and tv system worked perfectly for us. We particularly enjoyed getting cosy in front of the log-burning stove while we watched a storm rage outside - the big windows have stunning views of the sea and it's hard to tear yourself away. The grounds are great, we wrapped up and sat outside for an Ann's Pasties lunch on a few days, and having the Coastal Path right outside made for some amazing walks. Lesley, our host, could not have been kinder or more helpful, she made the whole experience so lovely for us and the welcome pack was brilliant. I'd recommend a stay here in a heartbeat ... except that we don't want the house to be too booked up for us to go back! Host is lovely and looked after us during our stay and kept us informed. We stayed for the week commencing 19th August. Fantastic location. Wonderful views from The Crag and the patio. Adjacent to the Coastal Path which was great. The location and indeed the house itself could not have been better. The Crag is beautifully decorated and comfortable and we felt very at home there. We met the owner on arrival and she could not have been more welcoming and helpful. The Welcome Pack was by far and away the best we have ever had ! Fabulous holiday and we will be back. I am delighted that you had such a lovely holiday at The Crag and thank you so much for leaving your feedback. Great location. Access to costal path and wonderful views. 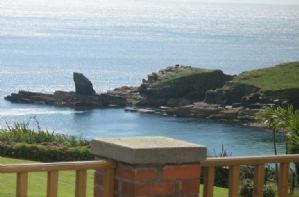 The Crag is well located for the beach and has a large garden, good for kite flying. The decor was rather tired, but otherwise it was quite comfortable and reasonably well equipped. The wifi was very slow and not really fit for purpose, and the tv package lost Sky films half way through the week - very frustrating for the teenagers in our party. Thank you for your feedback. I am glad you found the property comfortable but am sorry about the wifi and tv which I will investigate. lovely house is in a fantastic location, views were wonderful. Thoroughly enjoyed our stay. Stunning location and beautiful home. Well equipped and maintained. The owner could not have been more welcoming. The property is poorly maintained, and full of the owners clutter. The en-suite shower rooms are like small cupboards. Luckily we had good weather, spending most of our time on the well furnished patio. Thank you for your feedback. I am please that you had good weather and were able to make use of the patio and enjoy the amazing view. I am sorry that you weren't so happy with the inside of the property and we will ask the owner to look into maintenance issues. Fabulous location! The house was comfortable but more like a homestay property than a rural retreats rental, The property was expensive and for the price I would have expected more. A shower was broken and on suite toilet was broken and the corner bath taps were fairly inaccessible around the shower door, The welcome pack was not as listed. We had a great holiday but felt it was different from the many lovely rural retreats properties we've stayed in before. Wonderful location and well equipped house with lots of space. Beautiful view of the sea. Thank you for your lovely feedback for The Crag and its amazing location. Lesley the owner was excellent. Nothing too much trouble and the house was equipped to a very high standard. One small point, the grill in the oven does not work. Location of property superb. Not down to Rural Retreats I know but pity about the complete absence of mobile networks' coverage in the locality. 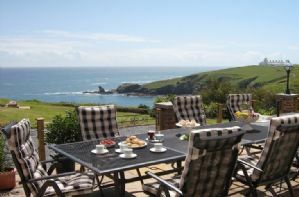 Extensive patio areas facing the sea with outside dining for eight, gas barbecue and several sun loungers. 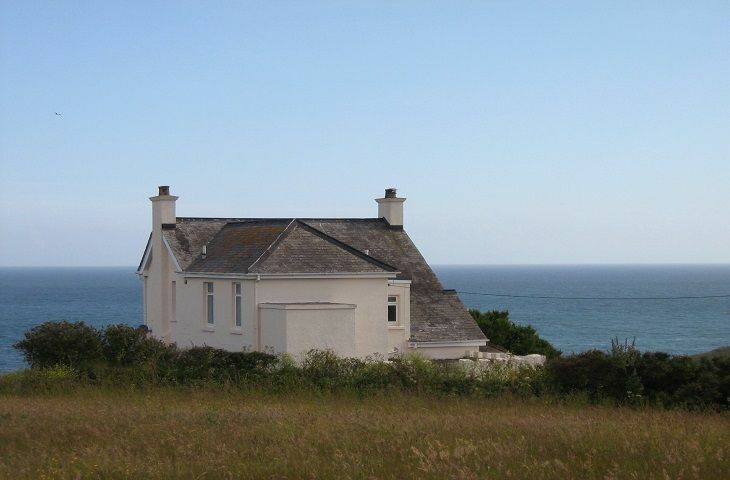 This fabulous Arts and Crafts villa sits in an acre of grounds on a front line cliff top, some 300 ft above sea level with breath-taking 180 degrees panoramic views of the sea and bay. 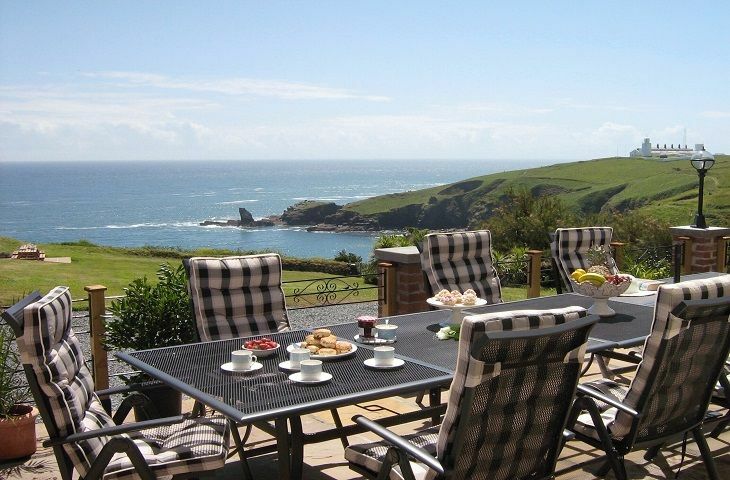 As one of England’s most southerly houses, it benefits from the warmer and sunnier microclimate of the Lizard Peninsula, renowned for its sandy beaches and coves and most recently used for the latest television series of Poldark. 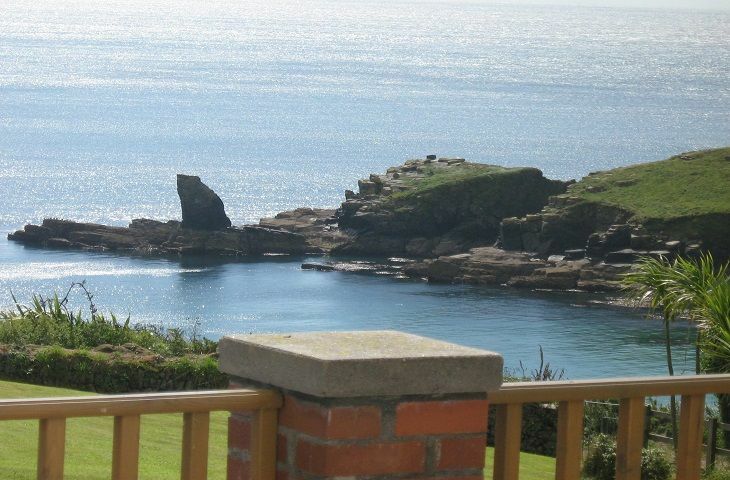 The garden gate opens onto the coastal path offering miles of stunning circular walks. Three hundred yards from the gate, along the costal path lies the small sandy beach of Housel Bay, which is hardly ever overcrowded and when exposed at low tide, is ideal for guests to enjoy right at their doorstep. The house is the last one before the sea on a 'no through road' in a hamlet of fifteen houses and although secluded, is not isolated, with the Lizard village only half a mile away with a small selection of food shops, cafes and pubs - not forgetting Ann’s famous pasty shop. Next door, below the house, is an exclusive family run hotel offering superb meals and the owner always looks after guests of The Crag, even providing breakfast if required! Well worth the extra journey, the Crag offers home from home comfort all year round, lovingly restored and retaining the original features of the hall mosaic floor and stain glass hall windows. 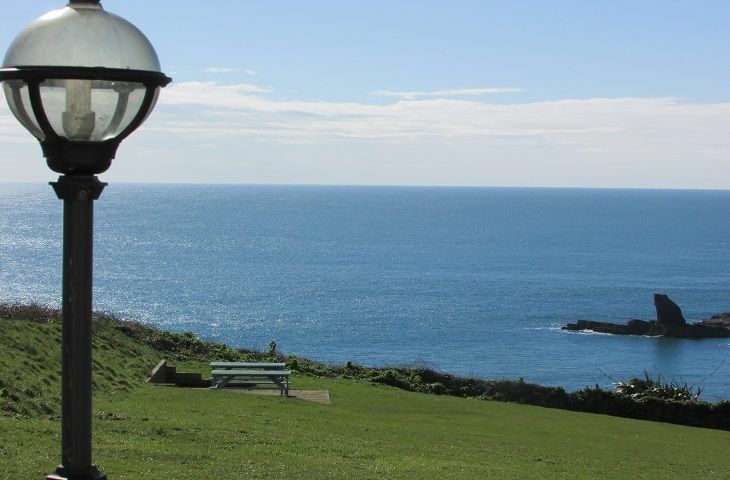 The spectacular views from the principle rooms, front bedrooms and outside patio are some of the most iconic in Cornwall, looking across the Bay and the Lighthouse, and feature in many calendars. 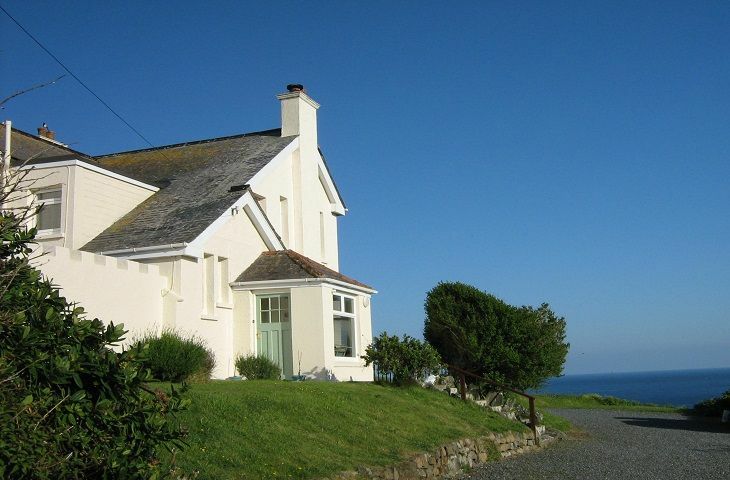 Huge picture windows and patio doors facing south to the sea allow maximum light and optimise the sea views to enjoy a summer evening or watch the Atlantic storms below in the winter ,curled up by the log fire. The Lizard Lighthouse is half a mile away and ensures the safety of the many boats passing in the channels. 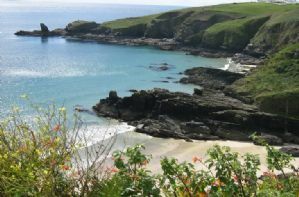 There are numerous sandy coves on the Lizard – Kynance, Mullion, Coverack and Kennack to name but a few – with the superb sailing waters of the Helford River nearby made famous by Daphne Du Maurier, and further afield Gweek Seal Sanctuary, Flambards Adventure Park and Porthleven, with the famous Rick Stein restaurant. Larger towns of Falmouth, St Ives and Penzance with St Michael’s Mount are all within easy reach, as is the cathedral city of Truro. In spring and summer, there are numerous famous gardens in which to appreciate magnificent camellias, azaleas and rhododendrons. 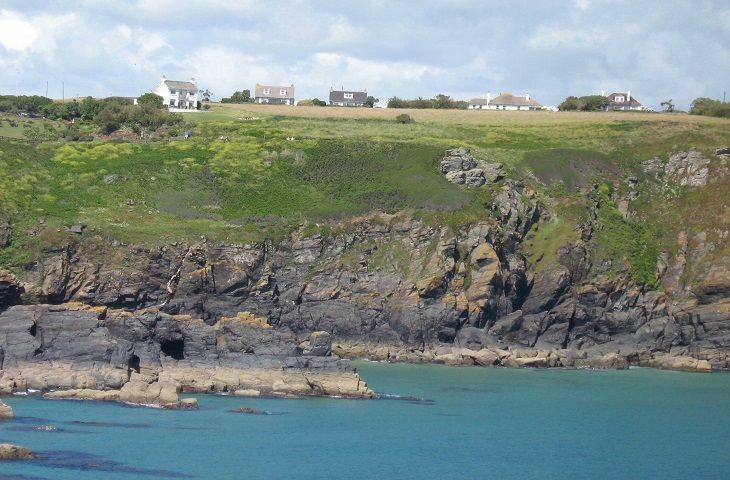 Roskillys famous ice cream is also locally made near Coverack and offers tea rooms and farm trials. In Mullion, there is the Chocolate Factory where you can watch chocolates being made. Crab and lobster are a local delicacy, with fishing and sailing available locally as well as golf and horse riding. Two en-suite shower rooms and separate family bathroom. Please supervise your children at all times in the garden, due to the proximity of the sea. Parking for four cars in a private drive. Helicopter access to garden is weather dependent. Original hall with arts and crafts mosaic floor and stain glass windows and doors. Electric double range oven, microwave, dishwasher washing machine and tumble dryer. Drinks cooler, larder fridge and freezer. 50 inch flatscreen television in the sitting room with both Sky movies and sports. 22 inch television with DVD player in the master bedroom with both Sky movies and sports. A selection of books and DVDs are available. A travel cot is available, please bring your own cot linen. Whilst towels are provided for use within the property, we do request that guests bring beach towels. 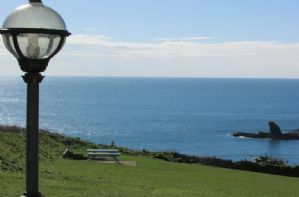 The property is ideally situated within the Lizard Peninsular, ideal for places like St. Michael's Mount, St. Ives, Mousehole, Newlyn, Penzance and The Helford River. Visit the world famous Lands End. Enjoy a trip to the historic St Michael's Mount. For a great family day out visit the Tate St Ives. There are an abundance of small seaside towns with a wealth of teashops, cafes, independent shops and restaurants. Visit the Engiish Heritage properties of St Mawes and Pendennis Castles.